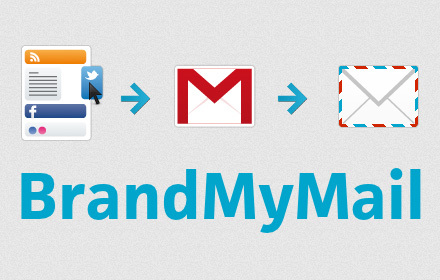 With BrandMyMail email has no longer a barren land and colorless, to be all a true showcase of our activity on social networks, with multimedia or content which we please relative to all the social networks that are involved. The add-on, available for Chrome and Firefox, allows integrating social content of all kinds in our mails. For example, we can include links, all applications, real-time content and social networking add-ons, as well as being extensively customizable by the user. So, not only have e-mails with the classic signature, but we can also put Twitter feeds, Facebook posts, WordPress blogs, Youtube videos, Google+ and other elements of other social networks, as well as contact details of each. We can integrate it as the signature of the message, or directly under a template. Each of these features is present through several plug-ins, which you can add/remove and set from the beginning, through BrandMyMail options. The add-in works only for Gmail and activated through the message template, we can choose when we send an email. In this way, not only to inject more life to our emails, but also is a good tool that can be used for corporate email and user groups.